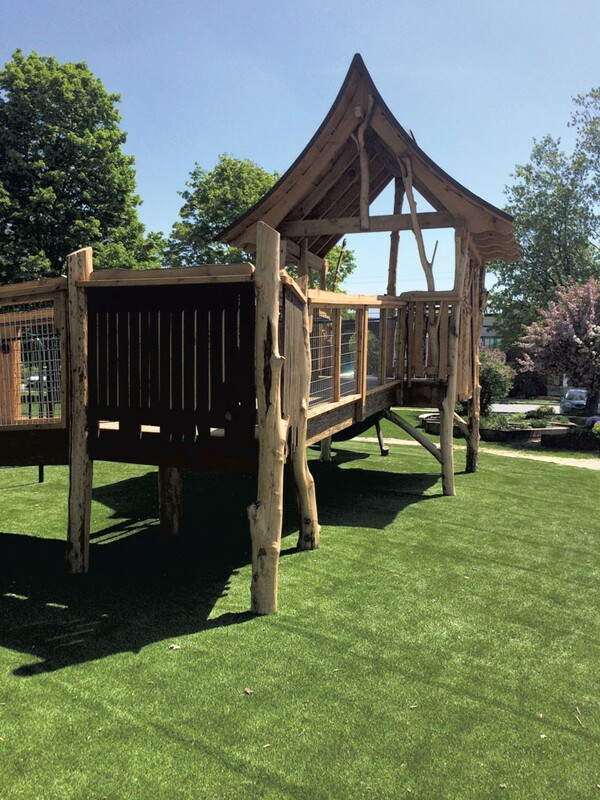 Bristol Green Playground | Destination Recreation | Kids VT - small people, big ideas! Unveiled in the fall of 2014, this play area in the center of Bristol gives young kids lots of options. The eye-pleasing natural wood structure boasts a wheelchair-accessible ramp leading up to a slide and a large wooden platform covered by a roof. AstroTurf blankets the ground. There's a circular set of monkey bars and a smaller structure geared toward the preschool set, with a small slide, tunnel and climbing features. A simpler, separate play area features logs protruding from the sandy ground at different heights, perfect for scampering across. A swing set includes two toddler swings, three regular swings and one handicapped-accessible swing. Picnic table, benches and gazebo on the green make for easy snacking and nursing. Peace Garden created by students at Bristol Elementary School adds to the picturesque surroundings. Older children may find the play structures too small or basic.